When you look at your child what do you see? Most mums see an incredible little person who has the potential to do amazing things in their lifetime. But have you ever wondered what your children think of themselves? For your child to recognise their own potential and their own strengths is a massive leap in the direction of self discovery.Simply sitting your child down and asking them is a great start. Having this knowledge allows your child to focus their energy on activities they can truely excel in and possibly even continue doing in the future. Knowing that they have a special talent or a skill they do well can be a huge self esteem boost for your child, this ensures they stay driven and focused as well as enjoy what they’re doing! How important is emotional awareness? Emotional awareness is something super important for all of us to have in todays world. Teaching our kids how to be aware of their emotional state is such a valuable tool for them to have in their back pocket especially when it comes to overcoming challenges. Emotional awareness is the ability to recognise your emotional state at any given time and posses the ability to keep positive regardless of external factors. At our Kids Empowerment workshops and our Mobile Disco Parties, we show kids how to use music to get themselves into a positive and happy state. For example; say your daughter just came back from school and had a bad day, we teach her how to switch that glum emotional state she’s currently in to a happy and excited one using music as a trigger! Having control over your emotional state is a priceless tool to have and will definitely help you and your child get through some pretty tough situations! How can a party foster great relationships for my daughter going back to school? With kids going back to school at the start of this month, it’s no surprise that birthday party bookings have kept our phones ringing off-the-hook! A new class filled with new faces can be a daunting environment for your little girl. As a parent you would be interested in getting a sense of your daughters new friends, right? A Giggles4Girls birthday party focuses on empowering girls and fostering stronger friendships. We do this through our wide range of specially planned activities. Where our girls are encouraged to appreciate one another, share what’s special about themselves and their friends. 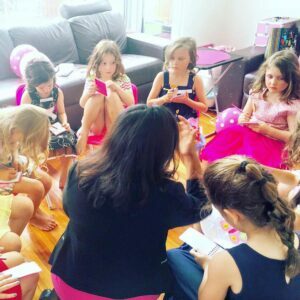 A Giggles 4 Girls party becomes a great way to allow your daughter to become comfortable with and get to know her new classmates. This also provides her with the opportunity to form lasting friendships! As a mum, you get to know the personalities of your daughters new friends, as you sit back and watch your child enjoy her party while we take care of the rest. What Happens At A Kids Empowerment Workshop? Bookings are flowing in, we have opened spots for a limit of 10 kids, so please don’t delay if you feel your child will benefit from the experience. Happiest New Year wishes to you and your family! 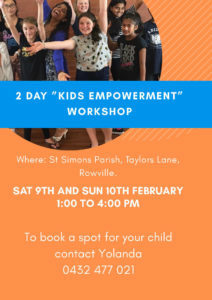 We are excited to start off this year in the best possible way for your child and for this we have put together a fun and action packed Kids ‘Empowerment’ workshop. Our Focus at our workshop is to create a safe space to allow our kids to recognize their “full potential” & equip kids with techniques to achieve their Best. Session #1. Prior to workshop understanding parents perspective of areas to focus on. Session #2. Post workshop sharing insights & suggestions on experience with child. If you know of anyone else that would benefit from this experience? Feel free to forward this message on. Hello! We at Giggles4Girls hope you all had an amazing holiday season filled with lots of joy, family, friends and giggles! After this rest and rejuvenation period Giggles4Girls are ready to begin celebrating with all of you! We’ve already had our first party for the year and are excited to keep our empowerment work going, and with this focus for 2019 we are overjoyed to put out our first kids workshop for 2019 on the 8th and 9th of February. to be held in Rowville. see our page for more details! There is much more research put out these days emphasizing the importance of being grateful. 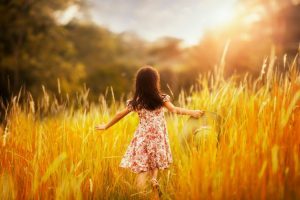 Some of the many benefits includes changes in the pattern of thinking, while as humans we’re negatively geared in our thinking, practicing gratitude shifts that, moving us to become aware of negative patterns and make a conscious choice towards thinking in ways that serve us and work in our favour. Being in a state of gratitude also improves our physical health and opens the door to better relationships. However, of all the benefits of being grateful the one that touched us the most was that it raised ‘self-esteem’. When seated together at family meal times create the space for each to share 3 things they feel grateful for, make sure you include a turn for yourself. Giggles 4 Girls parties for girls, which aims at empowering kids could not skip this opportunity to introduce gratitude as part of our party activities as well as kids empowerment workshop activity. Running out of ideas for your tweens birthday? 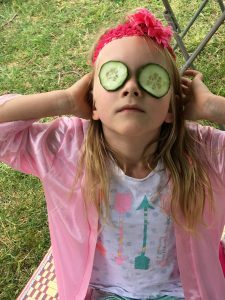 A pamper party is the way to go when you are trying to think of exciting ideas for your 7, 8 or 9 year old girl. It is the most popular theme for this age group because girls at this stage of their lives are mostly identifying with their uniqueness. They are not young enough to be princesses neither are they old enough to be teenagers. These tween-agers are finding their feet in their world, they love feeling like princesses but at the same time want to experience the ‘big girl’ stuff! This is where the Giggles4Girls Spa Spectacular theme party makes for the perfect theme for your 7, 8, 9 or 10 year old. Which is ideally suited for a group of anywhere between 8 to 12 girls. The girls are treated to pink lemonade and marshmallows while their feet are soaked in warm bubbly water sprinkled with pink heart shaped soap petals. Hand and foot massages are followed by getting their nails painted while games are played on little pink clip boards and little age appropriate girly magazines keep their fascination with growing up alive. Can you imagine how that would make her feel? What if you were able to create a space where each of her friends could share cool stories about each other? Share instances where your daughter reached out to help her friend or made her friend smile when she was feeling down. Or maybe a friend shared just how your daughters laughter made her happy when was down. Did you know that it’s magical moments like these that can build trust and togetherness and create long lasting friendships? Giggles 4 Girls ‘parties just for girls ‘creates just this environment where your daughter and her special friends not only experience ‘feeling great’ from being pampered and experience ‘looking great’ from having their nails, hair & make up done BUT… they also experience a special bond with the group of friends that they spend much of their little lives with. 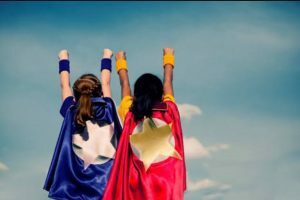 We do this by including a segment of appreciation within the activities in our parties… girls are encouraged to share positive thoughts and memories about their friends and about themselves too. each child is given a little journal called a “gratitude journal’ where they are encouraged to note down things they are grateful, share whats special about themselves as well as share what special about our birthday girl and the friends around. 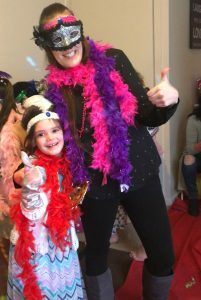 This segment of a giggles 4 girls ‘Spa spectacular’ party makes all the difference in strengthening the bonds of friendship among any group of friends. Try it out when among friends! Yes its that easy to not only feel good within ourselves when we share a positive comment about another but also creates a special bond that comes from sharing special moments and special girly giggles with each other. 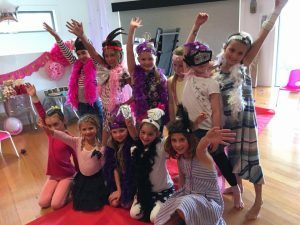 Book a Giggles 4 Girls ‘spa spectacular’ party today, tell us you were inspired to call us after reading this blog and receive 10% off your next party booking with us!! It does not take much to absolutely make our week ‘ Super Fantastic!!”. “Thank you so much for celebrating my daughter Sieanna’s 8th birthday with your disco theme. Sieanna had a fantastic day and so did all her friends! Sienna also enjoyed it when you hosted her 6th birthday the princess theme but the disco theme party was by far the best experience ever (her words) and she is already hinting to re. next year for another birthday with you guys.